Either you wish the world would swallow you up or you laugh it off, as you should. Yep, that moment had happened again where Gav (@Diathlete) talks about running from John O’Groats to Land’s End, shows the photo of the support group including me, and then tells everyone he can run faster than I can cycle. It’s true. Of course I don’t mind at all, cos Gav saved me: if he had not run 900 miles and needed a little support which I then gave for 4 days, then I would never have cycled 100 miles in 2013. 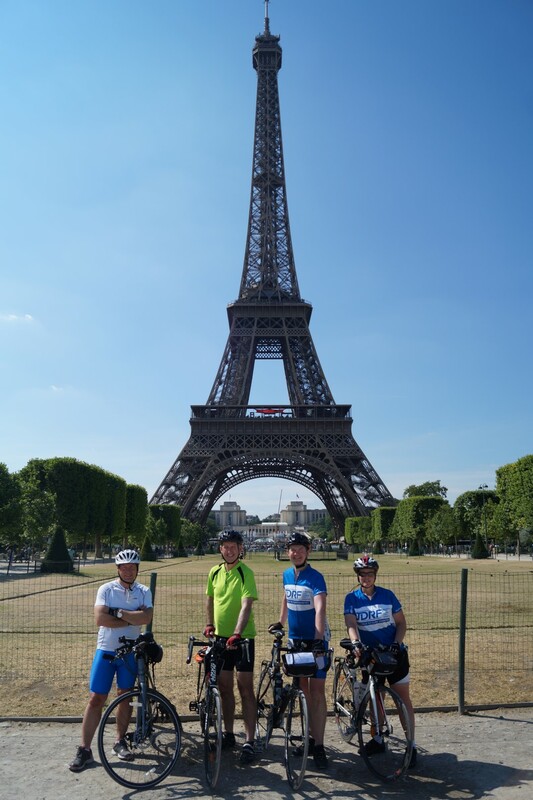 Which led to finding something I love to do, cycling 2000 miles each year since, completing 100 miles/day rides, cycling to Paris twice. Thanks Gav, that’s down to you. The day had started early when at 6-something-or-other a.m. I picked up Kelly (@diabeticqueen1) who was my travel companion for the day. Like Chas & Dave’s famous song – Rabbit – she didn’t shut up the whole way, she was clearly as excited as half of my Twitter timeline was to be attending #TADTalk2017. I didn’t mind at all, we had a lot to talk about what with various presentation collaborations, our Sugarbuddies peer support and our cycle together to Paris. I was keen to introduce her to lots of people I already knew and it made me smile when all I heard all day was ‘I love her/him’ as each speaker took their turn. Positivity is certainly the way forward. Although we’d not met in real life before when Jen took to the stage it felt like I was watching a friend or member of my family up there on that stage, someone whose story I knew a fair bit but whose full story was unknown to me, a story which made me feel a little sad, a story which showed grit and a great outlook on life. The same happened when Gav floored us with his achievments, Roddy amazed us with his expeditions, Mel’s sporting achievements and finally Adrian with his story of never really speaking about Diabetes – he’s really turned that corner now. Everyone so humble, so grounded, so unaware of just how bloody brilliant they are. Let’s face it, the whole event was freaking awesome – hopefully Catherine, Peter and Partha know how grateful to them I am – and we are – for the event – but they were some stand-outs for me. Some of the people who attended not only went but made themselves approachable to the masses, and I’ll highlight Karen Addington, Chief Executive of JDRF UK. Let’s not forget that Karen herself lives with Type 1 Diabetes but it was great to see her there, and get the chance to have a good chat. I’ve noticed this before at Diabetes events, that CEOs and Directors of the charities attend and make themselves approachable. I’ll always remember being cheered on cycling up Newlands Corner hill on RideLondon 2015, only to find out later it was one of JDRF’s Directors. At TAD we could freely have a chat with not only Partha and Catherine, but Bruce Keogh, Jane Cummings and Stephen Dixon too. Diabetes UK’s drinks event after TAD had finished was absolutely brilliant and I want to thank them for doing that, they didn’t need to, but it really extended a great thing of the day…being able to talk to each other. It gave us all another four hours or so or chat with our friends, some old, some new. Thanks to Michaela and Sally for organising this and for the D:UK leads for allowing it to happen. I’d asked Partha and Catherine if Nightscout could have a stand at TAD, as we did the year before when we were supporting Wes, Nightscout USA’s busiest advocate. Normally HCPs would say no, well let’s face it they can’t officially support something which doesn’t have the backing of clinical trials, and by some is seen as hacking. I understand and expect the ‘no’s’ but it was lovely to have a ‘yes’ and I’m pretty confident I know why they agreed: ultimately they know Nightscout/OpenAPS/LOOP make a lot of difference to their patients and they want the best for their patients. Us Nightscouters had travelled far and wide primarily just to be at the stand, yes we wanted to hear the talks but above all us we went to help people. Rather than just Nightscout we opted for a #WeAreNotWaiting table and were delighted for Alasdair to join us with his OpenAPS and LOOP kit. We had 5 Nightscouters and 2 Loopers present and each of us ended up speaking to a good few people, some learned about Nightscout for the first time, some had their nerves about setting it up quashed, many decided to set it all up soon. For more info about Nightscout, either visit nightscout.info or join the Facebook groups: Nightscout UK; CGM in the Cloud; Nightscout for Medtronic. For more info about creating a DIY artificial pancreas either visit openaps.org or join the Facebook group Looped. For more info on getting your Dexcom G4 data available on a watch or website take a look at this page. That brief comment Partha made to Mike about discussing a new idea got me intrigued. “If I can help, let me know” was my reply as we left the TalkT1 event in January. A few weeks later that idea was discussed between a few of us and so started the project which became T1Resources: a new web site for Type 1 Diabetes information, where linked content would be reviewed by both a health care professional (HCP) and either a person with diabetes (PWD) or a parent of a child with Type 1, like me. There’s already so much information out there on the web but who knows what is valid, what is inline with clinical/medical advice, what isn’t, what’s just plain wacky and finally what’s that never-going-to-work-Type-1-cure-with-cinnamon. T1Resources aims to address that issue by having links to useful information, with each link being reviewed by both one HCP and one PWD/parent. To work well and be effective this new site would need to get some decent (non-financial) backing, so Sophie – the project lead – started contacting many of the UK Diabetes industry charities and groups such as Diabetes UK, JDRF and INPUT. So far it’s got the backing of two of the main charities and many of the groups frequented by the UK’s leading Consultants, Doctors and health care professionals. It’s early days so hopefully more will follow. Each HCP/PWD review is done separately from one another and it is then decided whether or not that resource is added. I’m not going to blog about the process as it’s constantly evolving at the moment. In short if both HCP and PWD think the resource is valuable it will be added, if both say it’s rubbish it won’t be added. Anywhere in between and the editorial team will step in. Of course, it’s not quite as simple as that. Initially the team compiled a list of potentially usefull resources, several hundred were reviewed, many were rejected, the remaining were reviewed properly and one by one added to the site – something we’re still doing actually. But that’s not the vision for T1Resources, the vision is that this resource is for PWDs/HCPs, by PWDs/HCPs, so there’s a page for suggesting a new resource to be reviewed/added. Not all suggestions will be added but each will be reviewed. To everyone involved in this project up to now and in the future, this couldn’t work without a lot of dedication. From the tiniest of ideas to hopefully a very useful web site, I look forward to seeing this site grow. To Sophie for leading this project and tying it all together, this never could have happened without your input. To Mike for all your tireless work. I doubt any of us really know just how many hours you’ve put into this, of the work you’ve given up to do ‘just another bit’, to the family events you’ve now doubt missed out on. I love design of T1Resources – apart from the bits I don’t 😉 Hopefully you can put your feet up soon for a little rest. In my usual Pay It Forward stance all my time spent on this project has been free, same for everyone. Even Mike has paid for the site/hosting himself, although I sincerely hope he’ll be getting that money back soon. Recently I’ve become a Peer Support volunteer for Diabetes UK, answering a national phone line (0843 353 8600) for one evening a week as well as answering emails sent to my TalkToKev@diabetes.org.uk email address. I joined at a time when a promotion campaign was set to start and I was asked to share my story and experience. So I put some thoughts on an email to Sylvia, Diabetes UK’s South East Regional Media Officer, who produced a media release – shown in full at the bottom of this post. Yesterday the article appeared in my local newspaper, Southampton’s Daily Echo and has already generated a fair bit of interest judging on the number of hits this blog got yesterday. A 44-year-old Eastleigh man is offering support to people living with diabetes, with the help of charity Diabetes UK. Kevin Winchcombe does not have diabetes himself but has been sharing his first-hand experience of caring for a child with the condition through online blogs, twitter and Facebook as a way of letting people with diabetes know that there may be others going through similar situations. He is now being supported by Diabetes UK to use his personal understanding of the condition in their ‘Talk to Someone with Diabetes’’ peer support project. It is a special phone line, staffed by Diabetes UK volunteers, which anyone with diabetes is welcome to call. It is also available for relatives and carers of people with diabetes. The volunteers do not offer medical advice but crucially they can talk about the practical and emotional aspects of living with diabetes because they also live with or care for someone with the condition. Kevin’s daughter Amy, 14, was diagnosed four years ago with Type 1 diabetes, a condition that means people cannot produce insulin. No one knows exactly what causes it, but it’s not to do with being overweight and it isn’t currently preventable. The charity has trained Kevin to use his diabetes knowledge to reach out to people who are looking for support networks. So now in conjunction with his own experience, he feels confident to give practical and emotional support to people living with the condition on the telephone and by email. To contact Kevin directly visit the blog at http://circles-of-blue.winchcombe.org; email talktoKev@diabetes.org.uk; or on Twitter @oceantragic. To view profiles of all of the volunteers and start a conversation by email at any time, go to www.diabetes.org.uk/peer-support. Or if you prefer to speak to someone directly you can call 0843 353 8600. The service is open Sunday to Friday, 6pm to 9pm.